Today I'm going to try to talk about two paintings by Michele Araujo, with the caveat to myself and to you that one of the things I find interesting in them is how much they push back against being talked about. In fact, both paintings contain elements that are ordinarily legible — writing in one and a photograph in the other — but whose legibility Araujo has obscured. 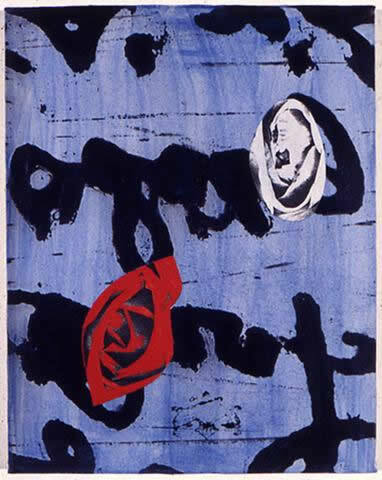 About the large black goopy marks that seem to move from right to left across this painting from 1994, Araujo writes that they are "a detail of a Spanish text from Columbus' journal. I never translated it. My father was Spanish-speaking but rarely spoke it in our home." Even if you can read Spanish, the letter forms are so engorged and distorted that you can't make out the words. Maybe a painting in which a text is both untranslated and illegible is a visual correlative of a father who speaks a language his child doesn't understand, and hardly ever speaks it in her presence. Just as the father's native mode of meaning-making is doubly removed from the child, so the legibility of the writing is doubly obscured in the painting. Paradoxically, the obscuring of the meaning becomes the meaning. The psychoanalyst Christopher Bollas, in his book The Shadow of the Object has coined a term that might describe this kind of experience: the unthought known. Bollas posits that a person's experiences as an infant, before that person has acquired language, continue to exist as memories, but can't be symbolized the way memories from the period after language acquisition can, because the experiences happened outside of language. So they are known, but they cannot be thought. They remain illegible and untranslatable, though they continue to exert force in the person's life. I would add that not only pre-linguistic experiences exist outside of language. Everything that isn't language exists outside of language. And, as Araujo's painting suggests, even language exists outside of language. While preparing to write about this painting, I debated whether to, in a sense, violate its self-imposed rules and read English translations of a few of Christopher Columbus's journal entries. I decided to, because, well, they're right here on the Internet and I couldn't help it. They are abundantly wacky. For example: he referred to himself in the third person as "the Admiral"; he consistently lied to his crew about how much distance they had traveled, always telling them it was less than it really was, "that the crew might not be dismayed if the voyage should prove long"; and he tried to understand things he was experiencing for the first time by comparing them to things he already knew — "Found the sea like the river at Seville, 'thanks to God,' says the Admiral. The air soft as that of Seville in April, and so fragrant that it was delicious to breathe it." Okay so maybe that last one isn't so wacky, it's a strategy I think we all employ when faced with something we don't understand: We start enlisting things we do understand to help us understand the not-understandable thing. In fact, that's what I've been doing all along here with Michele Araujo's paintings. But I also want to advocate for recognizing we're doing that and trying to not do it a little bit, on the grounds that whatever the new thing is that we're encountering is uniquely, irreducibly itself, and cannot be fully understood by means of the thing we already know, and, anyway, we don't really know the thing we already know because when we first encountered that thing we tried to understand it by comparing it to still other things we thought we already knew, and so on. Or, as the philosopher Avital Ronnell said, "Very often the emergency supplies of meaning that are brought to a given incident or structure or theme in one's life are ways of dressing the wound of non-meaning....To admit that we haven't really understood is much less satisfying and more frustrating and more necessary." I haven't even talked about the roses yet. They are, Araujo writes, "collage elements," and I don't know how to write about them without resorting to Shakespeare, who has his Juliet say of her Romeo, "That which we call a rose / By any other name would smell as sweet." She was talking about how his family name is Montague, and hers is Capulet, and the two families are at war with each other, which is a huge problem for these two because they are in love with each other and would rather just smell each other's sweetness and not have to worry about the names. In Shakespeare's play the names — the words — are weapons that inflict a fatal wound on the lovers whose lives they define. But aren't those red and white roses in the painting beautiful against its washy blue and goopy, scratchy black? I'm going to show you one more painting here, and please do yourself a favor if you have the time and just look at it for a while before reading what I have to say about it, even as you acknowledge that you're not looking at the painting but a low-resolution digital paraphrase or translation of it, and what Robert Frost said of poetry is also true of painting: It is that which cannot be translated. Michele Araujo is a friend and I happen to be looking right now at this painting she made in 2009. That dark straight line going down the left side of it, and the dark horizontal line along the bottom, and the dark rectangle rising up from it, and the rectilinear shape near the top, slightly left of center — these too are collage elements. Looking at the painting up close I can see that they are taped down over the paint. 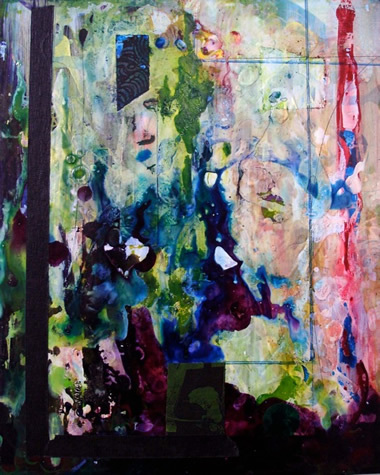 I treated this whole painting as an abstraction and the collaged pieces as just additional abstract visual elements until one day Araujo said to me, "Do you know what the Xeroxes are?" "What Xeroxes?" "The Xeroxes taped to the painting." "No, what are they?" "They're Faye Dunaway after she's been killed in Bonnie and Clyde." "You mean, right after she and Warren Beatty declare their love for each other and get shot to pieces by the police?" "Yeah." Well, I love that movie, and Faye Dunaway's performance in it is astounding, and now sometimes when I look at this painting I can't help seeing all the swirling, undulating dark red paint in it as blood. But I also don't want to let it be only blood. Araujo says when she makes these paintings she struggles with those Xeroxed elements, not only with whether and how much to make them legible, but also with the tension between them and the abstract gestures she makes with the paint. She tapes down the xeroxes on the wooden panels she uses, she paints around them, scratches the paint off or partially off with a razor blade, paints some more. And when I look at these two and other paintings of hers, I see elements that don't quite resolve, don't quite harmonize, things that continue to fight with each other after the painting is done. By way of returning to something I said at the end of Monday's blog, I want to make a leap from the perplexity of standing before these paintings to the perplexity of standing before other people, and again I want to encourage myself and you to not rush to eliminate that perplexity, because, well, if it isn't at least a little bit perplexing, then you're probably not doing it right.